This Giveaway is over, but you can still enjoy some beautiful Fusion Mineral Paint earth tones. Dawna P. from Murillo, Ontario is the winner of our Giveaway #10! My question to you was: "I think gardening and painting are good for my soul. What's good for your soul? Keep it clean gang, keep it clean." All of your comments sure brought a smile to my face! But, Sharon's comment pretty much had me rolling on the floor laughing. Then Sharon offered some beautiful words of wisdom. Sharon said: "LOL!!! I'm too old NOT to keep it clean! (Closing in on 70 yrs). I agree with the gardening/painting correlation. Gardening was my first love and although painting furniture is new to me, I did oil painting. We were created to be creative, it's like being carried away to another world, a realm of peace & fulfillment." Today's blog post is super short! I have been burning the candles at way too many ends lately and I am just starting to write this at 12:30 am. So, excuse any typos! I'm pretty sure that at this point you can guess our next Giveaway! Yes, another $50 gift card! That's the simplest Giveaway for me to coordinate and the winner can choose whatever brand of paint they want. I figure it's a win-win situation. I guess I would best describe these Fusion Mineral Paint colours as earth tones. The yellow is called Mustard. Below Mustard to the left is Putty and to the right is Lichen. The green is Bayberry. I actually have pieces painted in all of these colours, but I still have to take photos. I have a huge (and I mean huge) birdhouse painted in Putty that I can't wait to share with you! It's so big, that it takes two of us to carry it. It is really, really cool! And just for the heck of it, I made a quick brushstroke in the colour Cranberry to show you how well it matches these great earth tones. I have been taking photos like crazy! Here's a screen shot of just a few of them. 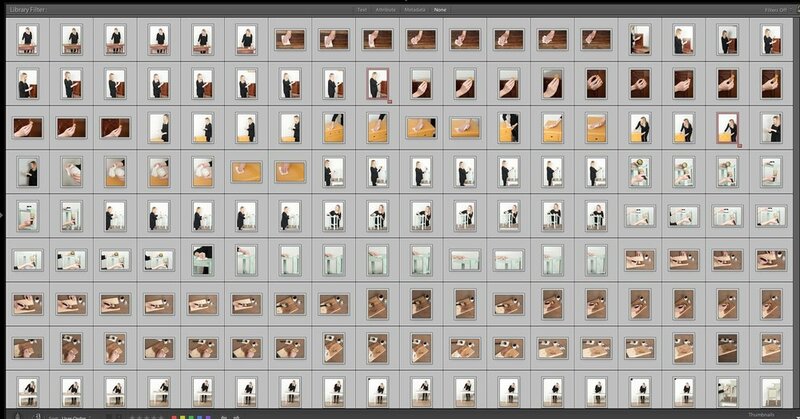 I have over 500 images to sort through, so it's going to take me a while. But, I am so excited! My friend, Hayley, has been modeling for me so that I could do some step by step photos on how to use various products. So, watch for a whole whack of tutorials in the next few weeks! Posted on January 24, 2017 by Sue Sikorski and filed under Fusion Mineral Paint and tagged 2017.